A long while back, I reported on how St. Louis "Democrats" were being paid off by extreme right-wing ideologue Rex Sinquefield to work on the ballot initiative restoring local control of the police department to St. Louis. As I've said many times, I support local control, and in fact worked with the groups who had been pushing for local control long before it occurred to the St. Louis establishment that it might be a politically useful campaign. However, I had concerns about the way the campaign was being run as a PR campaign for Rex Sinquefield and anti-tax groups around the state. Voted to ban the existence of gay/straight student alliances in Missouri. Was a co-sponsor of HB885 in 2004, which would "Prohibit public institutions or any entity receiving state funds from adopting discrimination policies that exceed state and federal protections against discrimination." Voted in favor of placing a constitutional amendment banning gay marriage in Missouri on the 2004 ballot. So Casas wrote an article for St. Louis's premier LGBT news source asking people to hand their contact information over to a dude categorically opposed to equal rights. And to make it worse, rather than just being honest about it, when I asked Casas about who was handling the emails from the petition, he responded by claiming: "I have no idea! I'm working on #LocalControl!" The idea that Casas, a failed candidate for state office, had been contracted to get signatures to an online petition without having any idea of what would be done with the signatures is pretty ridiculous, even for him. So now we have a new Sinquefield-backed initiative, described by the St. Louis Post-Dispatch way back in August, created to "study" various aspects of City and County services. Again, I personally think the City and County should be merged. But like the Post-Dispatch editorial board, I think this discussion should be transparent and honest, rather than opaque and deceptive. However, rather than being honest, the group, staffed by Rex's previous campaign operatives, is pretending to be unconnected to Rex Sinquefield. 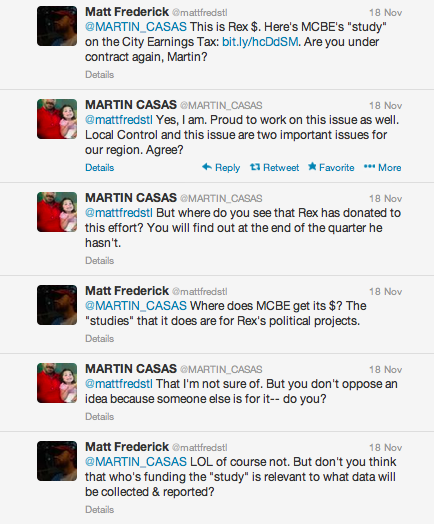 So for starters, let's just be clear that the Twitter feed for the group, Better Together St. Louis, is run by Martin Casas. With his usual stealth, Casas managed to tweet and post on facebook an identical post using his personal account and Better Together simultaneously, demonstrating that he's running both. So Casas, for the second time, gets very confused when he's asked about whether he's working for a Sinquefield group and in what capacity. 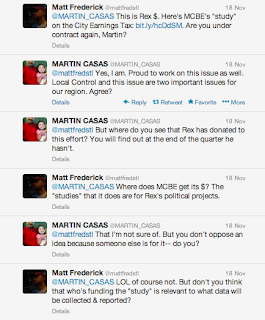 Of course, in the grand scheme of things, Casas is pretty irrelevant to whatever policy outcomes might occur. Yet this whole approach is suggestive of a broader disdain for the public from the group. Rather than simply being up front about Sinquefield's involvement, the effort so far has been designed, rather sloppily I might add, to act as though Rex has nothing to do with it, though he clearly has been involved in the planning and financing of the plan for a long time. And if they can't just admit that he's a key part of the effort, what else are they trying to hide? And more importantly, as the Kansas City Star's Yael Aboulhalkah asked, "What's in it for Rex?" The St. Louis Activist Hub blog is the home of weekly event listings for progressive activism across St. Louis. It is also a group blog where a variety of St. Louis viewpoints are presented. You can follow the Activist Hub on Twitter and join the Facebook group for further ways to stay connected. Politically Correct, or Particularly Conscientious?